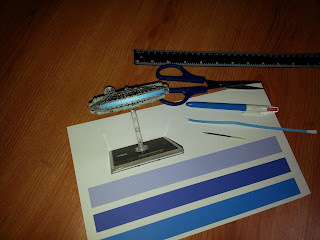 Arts and (Space)Crafts is a series of articles here on TheMetalBikini.com where I spotlight some of the more hobby-oriented aspects of X-Wing Miniatures and share them with y'all. 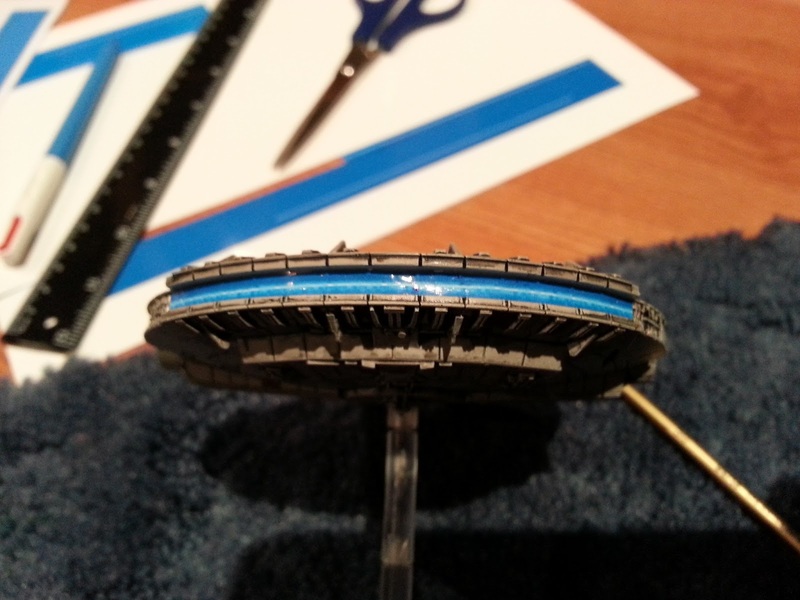 My main man from Oz-land comin' through again with another brilliantly simple hobby mod for y'all. Take it away, Flocky! Got another one you can use if you want Clint. The incredibly easy Millenium Falcon engine modification. Basically I printed off different colour (HA HA spelling) blue strips from my printer and then cut them down to size to fit in the slot of the Falcons engine. Use the tooth pic to add a curve to engine strip to allow it fit easier. Then just push it flat. Cut the excess off the ends. Viola!! No gluing required. It just sits in there nicely. Its a cheap mod. No painting to screw up and removable. The next step up would be to use glossy photo paper to make it really shine. Also if you have photoshop skills you could make a white stripe in the middle, fading out towards the edge. I do not possess these skills. I went with the solid colour. But if you or a fellow Metal Bikini aficionado could do it that would be great. P.S. I got my friends to view your site and they said "Who the hell is Pete? You're Flocky." I don't know if Australia has a space program, but if they do, this guy should work for them. 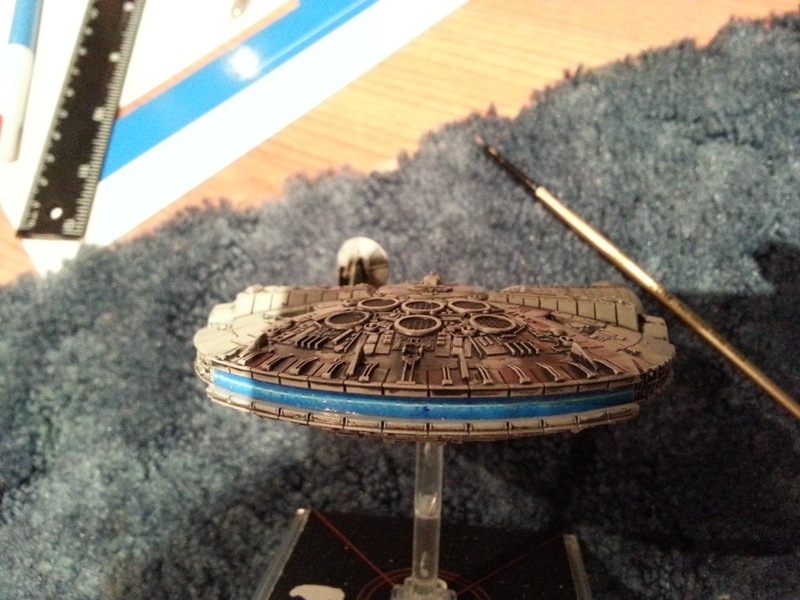 I mean, honestly- how many times have you been playing a match, looked at the back of your YT-1300 and thought to yourself, "Man, I oughta paint that blue. ", but then not done it because you thought you'd screw it up? So brilliantly simple, man. I love it! New and improved Falcon engine with gloss photo paper. I added a lighter colour line in the middle to simulate the inner hotter part of the engine going to the blue cooler colour on the outside. I did this with the basic Windows 8 paint program, nothing more. Printed it out and cut to size. Now I will adjust the maneuver dial to add a green straight 6 ahead! LOL If it could do a 4 straight with the engines OFF, well the engines are ON now aren't they? Completely agree, PAL. And on the off-chance we meet up sometime for a game, I'll totally let you pull a straight 6 with that Falcon. Best believe that! Obviously, you can make your own, but if you want to use Flocky's blue strip with the white interior, here's the image he used in his print out. For reals- how hot is that? It looks brilliant! I'm totally going to knock this mod out this weekend.